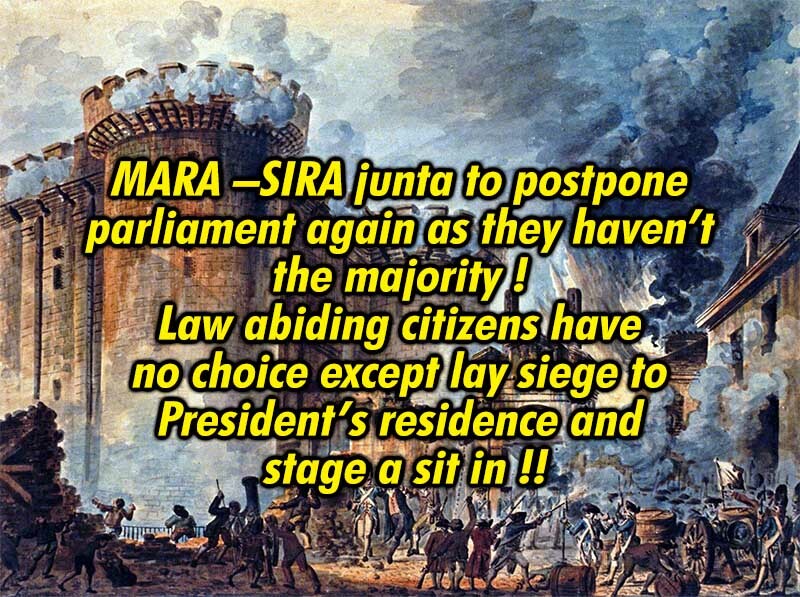 LEN - www.lankaenews.com | MARA –SIRA junta to postpone parliament again as they haven’t the majority ! Law abiding citizens have no choice except lay siege to President’s residence and stage a sit in !! MARA –SIRA junta to postpone parliament again as they haven’t the majority ! Law abiding citizens have no choice except lay siege to President’s residence and stage a sit in !! (Lanka e News – 04.Nov.2018, 4.30AM) What no leader who ruled the country so far did to destroy the economy , peace , laws and the constitution on a scale that would never allow the country to be retrieved is being done by unpatriotic power greedy president Gamarala which is a clear confirmation of his earlier warning that he would set fire to the country before he is discarded. While the country is in dire problems and in a dismal state with the economy declining by the day ,yet owing to his latest ruthless self centered agendas and lawlessness he has once again decided not to convene parliament on the 7 th . Thereafter on 1st night (day before yesterday) , the UN gen. secretary Guterres had to phone SL’s brute of a president and request to respect the country’s constitution , the lofty ideals of democracy and sovereignty of law , while also to ensure people’s security and safety in order to re stabilize Gamarala’s own motherland . The president a perfect epitome of an ignoramus had replied he has done everything according to the constitution. Guterres in response has said , surely the country’s president should know the Sri Lankan constitution . President Gamarala had said , however he cannot say the date on which the parliament will be reconvened , although it will be done. He had not promised to Guterres parliament will resume sittings on the 7 th . That means the parliament will not be reconvened on the 7 th. Instead of taking lawful measures to stabilize the country , every day MPs are being bought over paying staggering bribes while the television channels daily telecast such ministers being appointed on a dry ration basis . Their only dastardly goal is to postpone parliament sittings until they secure the majority by buying over MPs and by posing threats while the country is being driven into an unprecedented ruination. If the first citizen and so called second citizen recently appointed of the country are conducting themselves as scoundrels while outrageously paying bribes to buy over the MPs most unlawfully , what is the purpose of having an independent Bribery Commission and the rule of law ? What is the worth of the religious leaders if they are to keep their eyes and mouth shut while the country is being fast plunged into anarchy before their own eyes owing to cruel leaders of the state ? . President the first citizen is openly and dangerously violating the constitution. The prime minister the second citizen is unable to decide who is the prime minister . In these circumstances the third citizen the Hon. Speaker is unable to violate the constitution and of his own accord summon parliament .If he does that it is likely the entire country too can take the law into their hands . Might we remind even now the international community is respecting the UNF because they have always abided by the laws . The speaker too is respected by the International community because his conduct so far has been most honorable and had given due place to state diplomacy. After the president has issued a Gazette notification postponing parliament , convening a parliament is illegal until another gazette notification is issued by the president. The speaker yesterday did what he could do within the framework of the laws when he summoned the MPs to parliament . On that occasion the MPs have signaled who is in the majority . It is evident Pallewatte Gamarala is again going to break his promise and postpone sessions of Parliament further . He is a shameless two legged cut throat manimal who has become a byword for broken promises as he never honored the promises he made to the people .For such a shameless scoundrel of a president violating the constitution is simple. Under the circumstances the law abiding citizens have only one option :Lay siege to president Gamarala’s residence at Paget road , and stage a sit in protest never to get up until parliament is re convened. That is the only course of action available to every Democrat and the leftists when there is no other avenue in the best interests of the country. The forces who act constitutionally has no choice except to give protection to the followers of democracy . They have no right to follow unlawful orders because they have sworn on oath under the constitution they will safeguard it. The aims and efforts of the people must be not to make any individual the ruler but rather protect the constitution which is being torn page by page ruthlessly and unlawfully by the president despite being the highest in the hierarchy ; and to see that the parliament is reopened. In that event , if the security forces abide by unlawful anti democratic orders , woe betide because such transgressors are going to be hauled up before the international criminal courts one day . When that happens even Sakkaraya(deity) cannot rescue them !